Despite initially not being particularly bothered about attending this event (as it was a senior comp so would be very difficult and was not in my favoured discipline), I ended up finding the Senior British Bouldering Championships one of the most exciting events I have ever been to. Located in a tent outdoors on Devonshire Green, Sheffield, the BBCs was part of the annual Cliffhanger festival, a festival showcasing outdoor sports with food stalls and live music to add to the atmosphere. However, upon arrival in the heavy rain, my initial feelings were not entirely positive and I began to wonder whether it had been worth turning up at all. The qualification format was one with which I am not entirely familiar-5 mins on 5 off for 5 problems (so no extra time to read the problems and no chance to grab some other beta)-and I found it stressful to figure out my own beta and get each problem done in the time. After almost flashing the 1st block but slipping off the last hold and then being unable to repeat the start, I did not feel positive at first. However, a flash of the 2nd gave me a confidence boost. Unfortunately, this was to be my only top, but it was enough to sneak into semis at 18th place (with 20 in semis). After a good rest I awoke early on Sunday to get back to the wall before isolation closed at 11.30. I felt more comfortable with the time format and knew that even if I screwed up, I could only move down 2 places and, being one of the first out, the problems would not be too greasy. With only 4 blocks to climb, the semis was less tiring and went quickly-I soon found myself sat on the mat at the end smiling, for I had managed 2 flashes and 3 bonuses, a result good enough to at least retain my 18th place. However, to my surprise, I found myself sitting at the top of the score board for a while. Waiting anxiously by the barrier to watch the others, I counted down as people scored below me...a top ten finish was within site. When it came to the last 4 or so climbers and I was still sat comfortably in the top 3, Watching the last climber-Shauna Coxsey, overall Boulder World Cup Winner of 2016-fall of the last problem (one which I had got first attempt) was something I did not expect! 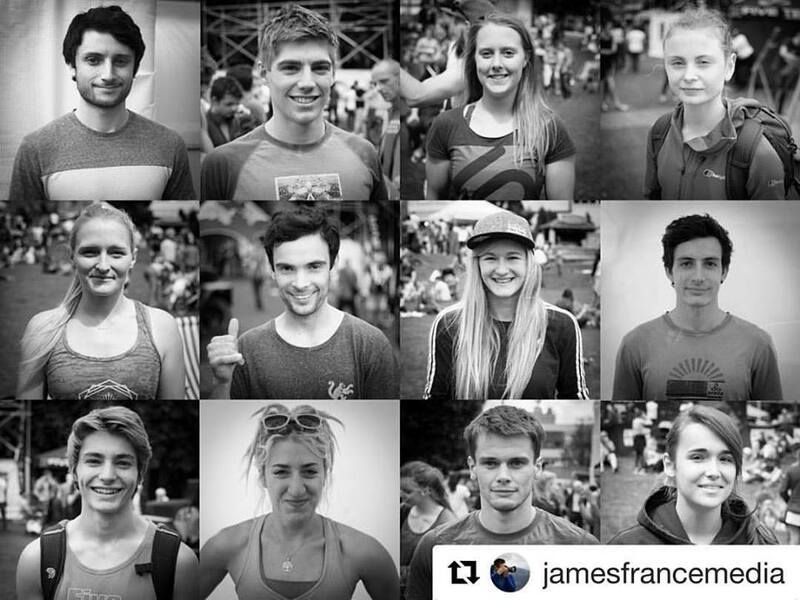 The final results were announced and I had somehow qualified for the final of the Senior British Bouldering Championships in 4th place (with 6 in the final) along with seasoned comp climbers (and world ranked athletes) Shauna Coxsey, Tara Hayes, Michaela Tracy, Leah Crane and Gracie Martin. As the youngest (by 3 years) and least experienced of the men and women in the final I was the clear underdog-the Wales of the European Football Championships. The finals was incredible. With people from all over the world watching on the live stream as well as the live crowd, I felt anxious but excited and gave it my all. Being one of three to top the 1st problem and narrowly missing out topping the 2nd, I was pleased with my climbing despite finishing in 6th. Well done to everyone who competed and thanks for all the support from the viewers!